The group blames Buhari for the death of some of its members during the Army’s operation python dance and the subsequent disappearance of its leader, Nnamdi Kanu. -They also insisted the person been referred to as Buhari is an impostor from Sudan. Buhari warned against stepping foot on Biafra soil. Members of the proscribed Indigenous People of Biafra (IPOB) have sternly warned President Muhammadu Buhari to shelf his planned trip to the South Eastern states of Ebonyi and Anambra state. 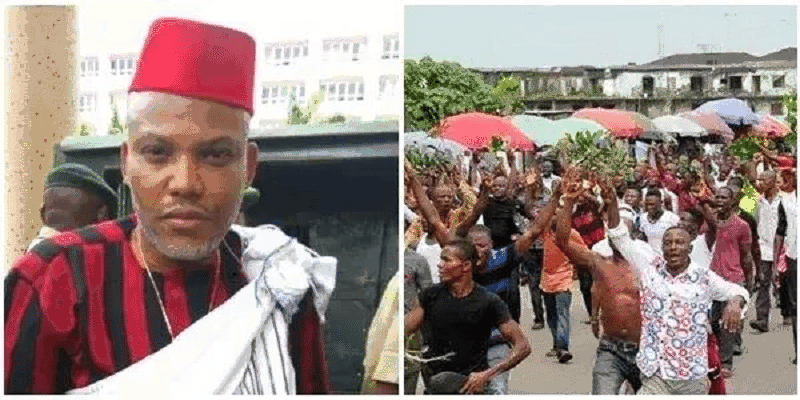 In a statement issued by the group’s spokesperson, Emma Powerful, on Monday, IPOB said that the president’s visit will mean blood shed in the region. The group also insinuated the president is operating with a body double whom they identified as Jubril from Sudan. The IPOB statement also blamed Buhari for the death of 91 IPOB members allegedly killed by the Nigerian Army during the controversial Operation Python Dance II which held in the South East as well as the sudden disappearance of its leader, Nnamdi Kanu. They maintained President Buhari’s planned visit to Anambra is targeted at tipping the scale in favour of the All Progressives Congress’s candidate during the state’s gubernatorial election on November 18. The statement reads: “The consequences of any fall out from the visit of the impostor Jubril to Ebonyi State will rest squarely on the head of Chief John Nnia Nwodo, Gov. Dave Umahi, Rochas Okorocha and the rest of South East governors. “Bringing this version of ‘Buhari’ to insult the memory of those killed at Enugu, Nkpor, Igweocha, Aba, Onitsha and lastly Umuahia will not be tolerated by IPOB and every right thinking Biafran for that matter. “This is tantamount to an Israeli politician inviting Adolf Hitler to visit Jerusalem to mock the Jews he slaughtered in Concentration Camps during the holocaust.